To the Tuileries Palace in Paris on Saturday, January 28, 1809, Napoleon Bonaparte, then France’s Emperor, summoned five of his closest advisors. He had just raced back from the war front in Spain, and wanted to discuss the course of the war and the growing discontent among the French with Napoleon himself. 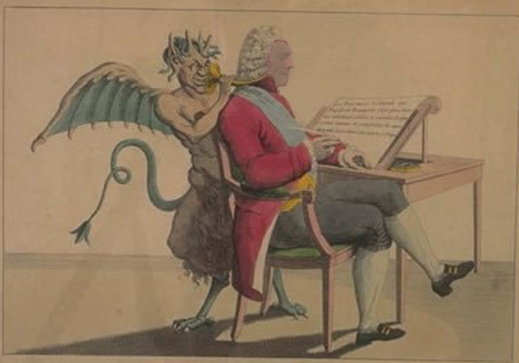 Accusing Charles-Maurice Talleyrand-Périgord of betrayal, Napoleon launched at him the most famous line of contempt a politician has ever publicly issued to a subordinate. At the time Talleyrand, the foreign minister, was secretly selling his intelligence on Napoleon to the Russian ambassador in Paris. Four years later, in March 1814, when Tsar Alexander I entered Paris with his troops and Napoleon was in temporary retreat on the island of Elba, Talleyrand hosted the tsar overnight at his Paris mansion. They were together as the instrument of the city’s capitulation was being drawn up. Aside, Talleyrand told the tsar’s intelligence chief he was ready to switch sides if paid a much larger stipend than he had taken for his spying to date. It’s that last phrase which, more than two hundred years later, still sticks to the name of Talleyrand. The question still not answered, despite all the evidence of Talleyrand’s career as a betrayer of everyone and everything (except his bank balance) is Napoleon’s own: why did he keep Talleyrand on for so long? That’s for historians. For today in Moscow the question is: why does President Vladimir Putin keep employing spokesman Dmitry Peskov (lead image, right*) when out of the latter’s negligence, miscalculation and his Talleyrand-sized desire to collect and display wealth, he has caused damage to Russia’s state interests? In December Peskov told reporters “I do not make personnel decisions; the President makes personnel decisions.” He acknowledged then and in subsequent remarks that following the March election there would be staff changes in the Kremlin, and that he might not remain as Putin’s spokesman and head of the Kremlin press office. This week a source at the Kremlin press office dropped the hint that Putin has reappointed Peskov. Asked who is to host Putin’s annual Direct Line television talk-show, scheduled for June 7, the Kremlin source said it would be Peskov. In the past, Peskov has hosted Putin’s December national press conference, but he has not been the on-screen director of Direct Line. On June 7, it will be a full month since Putin’s re-inauguration. It’s two weeks since the new government ministers were announced. The Moscow press has been reporting the semi-official news that Putin’s chief of staff Anton Vaino and deputy chief of staff Sergei Kirienko are keeping their posts. But there has been no word about Peskov. So is the nervous Peskov making an attempt to pre-empt the President’s decision on whether to reappoint him as spokesman and head of the Kremlin’s press, propaganda and public relations operations? Peskov, 50, comes from a Soviet Foreign Ministry family, as did his second wife; his first wife was granddaughter of the Red Army Marshal Semyon Budennyi. Unlike his in-laws, Peskov stopped short of the top rank. He started in the Foreign Ministry in 1990, rising slowly through the ranks to First Secretary. Eight years — all of his foreign posting time — he spent in Turkey. Peskov (extreme left) is the only member of the Russian delegation without translation earphones for this session with President Recep Tayyip Erdogan, Ankara, December 1, 2014. Elizaveta Peskova, Peskov’s daughter by his second wife, also speaks Turkish. Peskov then started as a press officer in the Kremlin in 2000; he has been Putin’s spokesman at the presidency and the prime ministry. His present post, which also includes the power to direct the budgets and operations of the state media, commenced in 2012. 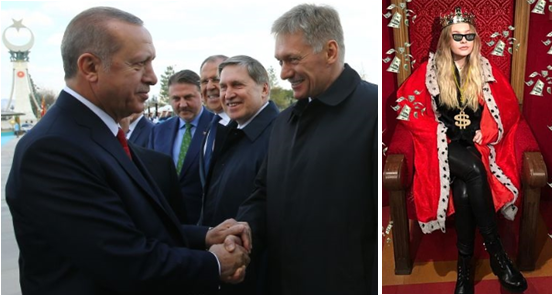 Left: Turkish President Erdogan gives his double-handed appreciation of Peskov’s long relationship with Turkey at the official welcome ceremony for President Putin in Ankara on April 3, 2018. Right: In an intimate show of her appreciation for Turkish generosity, Peskov’s daughter released this photo in a 37-picture album published by the Turkish daily Hurriyet on August 8, 2017. The newspaper also reported that she was advertising shipyards. Russian government officials and their wives are required to make annual disclosures of their income and assets, so it is well-known that Peskov’s third wife, the professional ice-skater Tatiana Navka, has been earning far more than her husband; more than any other spouse on the Kremlin list. Peskov’s reports for himself show that since 2014, when the Russian economy went into oil-driven decline and the US war commenced, Peskov has been doing financially better than ever. Compared to his income and assets in 2009, Peskov has gathered three and half times the cash; five times the real estate space; and two additional vehicles. Investigative reporting by independent Russian reporters, and by the anti-Russian press in the US and UK, have questioned an expensive watch, wedding celebration and honeymoon yachting trip in the Mediterranean from which Peskov has benefitted. They have been identified as wedding gifts from his wife and other well-wishers. Peskov and Navka exchange rings (left) and a watch (right) at their marriage on August 3, 2015 . The wealth displayed by Peskov’s second wife after their divorce, has also been voluntarily disclosed to the Russian press. 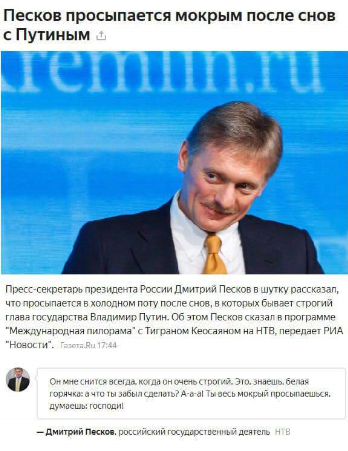 As head of the Kremlin press office Peskov directly manages an unreported budget for that operation; he also supervises the sizeable budgets of the Russian state media organizations. Because these have come under sustained attack in the US and the UK, no details will be reported here. The attacks on Russian media, which have been part of the cyberwar directed from Washington, were analysed most recently in this report. The sources agree that Putin is his own best spokesman, and speaks better than any of his peers around the world – without a spokesman to clarify, elaborate or correct. What is remembered are Peskov’s own maladroit remarks. The best known of these was his comment on Moscow protesters who had clashed with police at Bolotnaya Square in May 2012. “Their liver[s] should be dragged along the road,” Peskov said. Peskov’s counterparts in Moscow -- left: Maria Zakharova, spokesman for the Foreign Ministry; right: Major-General Igor Konashenkov, spokesman for the Defense Ministry.